If you haven’t heard of Canada’s Anti-Spam Legislation (CASL) by now, then you’re pretty good at filtering out email. The new law that went into effect July 1 has many businesses blasting out emails to their list of recipients asking for permission to continue communications. The reason, as many of those emails explain, is that CASL requires that a business prove it has obtained express consent from a customer before sending them a message. Just allowing someone to opt-out of getting emails isn’t good enough. Since this is a new requirement, many businesses just don’t know what customers they’ve received implied consent from as opposed to implicit consent through some other sort of business relationship. So many Canadians might be suffering from more inbox overload than usual these days. All those consent-request emails start to blur together and look the same after awhile. It can be tempting just to not respond to any of them and look forward to a cleaner inbox in the future. But there are some messages that stand out from the pack – they’re unique in their approach, funny, weird, or just plain bad. We’ve gathered up a few to share with you here, including our own approach to CASL. IT-focused social networking site Spiceworks found a novel way to stand apart from all those other consent-requesting messages clogging up your inbox. It threatens to feed a real member of its email marketing team to zombies unless you opt-in to continue to receive messages. Spiceworks tells us this isn’t specifically part of a campaign around CASL, but is a global check with users to check to make sure they’d like to receive emails. It has a policy to regularly check that its content is still relevant to user interests. That being said, the opt-in approach to continue to receive emails would meet compliance requirements under CASL. 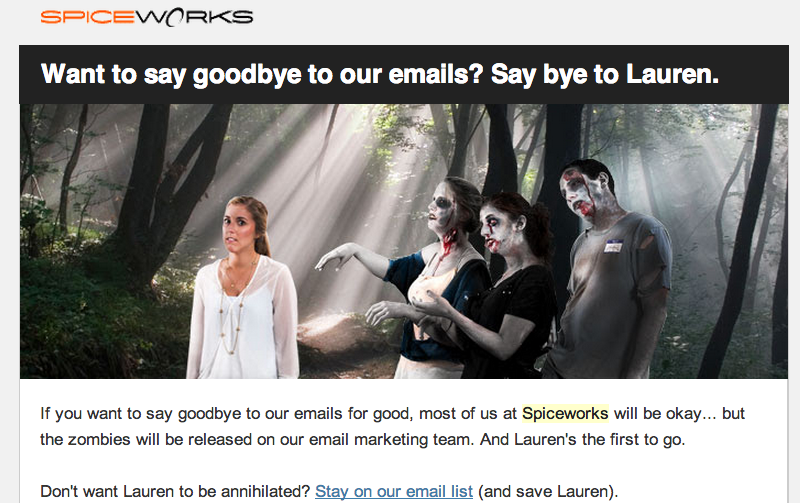 “Zombies are a popular topic in our IT community,” explains a Spiceworks spokesperson. You can tell there were definitely some brains behind this consent-gathering campaign. 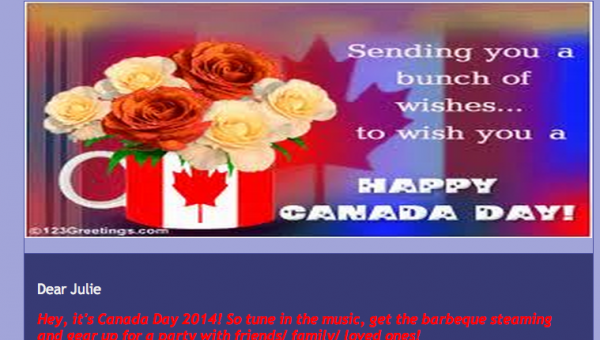 Nothing makes you want to consent to more emails from your local spa than a pixelated banner combining patriotism with a garish colour palette and redundant grammar. It gets better from there with the bolded and italicized red text on purple background (meanwhile the grammar is not improving). Unfortunately the email recipient must then take action to opt-out of receiving future emails. That’s a CASL no-no as express consent requires that one opt-in (unless you already had express consent previously). But the spa makes up for it later in the newsletter with an offer for a free manicure between July 2-14 and a 20 per cent coupon off your next hair cut. This web service that sends its subscribers summaries of business books acknowledges the annoyance of many Canadians dealing with an avalanche of CASL emails lately. The email also offered recipients the option to opt-out. But since this email was specifically sent to a list of those who had already given express consent, that would be CASL compliant. As explained by Actionable Books, the email was designed to not be bothersome to its recipient while improving the open and click rates on campaigns for those who actually wanted the content. There are few marketing tactics that are as clearly distinguishable in brand as Reader’s Digest. Anyone who’s ever been on its snail mail list will be familiar with the front-of-envelope promises of opportunities to win huge cash prizes and official-looking certificates declaring exclusivity. Those trademarks continue in the email realm as well. This CASL consent request comes complete with a “notification certificate” that I’m for sure going to pin up on the wall next to my Journalism degree. It’s only fair to point to our own consent gathering policy when it comes to CASL legislation. As a digital media publisher that sends out various email newsletters to subscribers, sending out emails to our audience is an important part of our business and we definitely read the CASL legislation thoroughly and thought hard about the best approach to take towards compliance. In the end we chose to not send a specific email asking for our audience’s consent again, as this is already our practice when readers opt-in to receive our newsletters. Our President Fawn Annan explains the full policy and approach in this open letter. Have you received some strange or unique CASL emails that you thought were great, or maybe not so great? We want to hear about it. Please share in the comments below.